College affordability has reached crisis levels across the country. Years of state budget cuts to higher education have led to higher tuition and fees, and mounting student debt—all while the students have become increasingly economically and racially diverse. In Massachusetts, per-student state funding for public higher education fell 32 percent from Fiscal Year (FY) 2001 through FY 2018. Large increases in tuition and fees ensued, as did the debt burden that students and their families had to bear in order to afford these costs. Over the past several years, a number of cities and states have responded to the college affordability crisis by creating tuition-free or debt-free higher education programs, known as “Promise” programs. The “promise” is the elimination—or at least reduction—of cost barriers for students accepted to college. In reality, Promise programs have been designed with various restrictions on which students and institutions are eligible, what costs are covered, and more. This paper discusses the key design elements of a Promise program, and offers lessons for Massachusetts as it considers a number of proposals to make college tuition-and-fee-free or debt-free. Based on a review of the relevant literature, including case studies of existing Promise programs and data on college and university students in Massachusetts, this paper offers an equity analysis of the different design elements of a Promise program. That is, how do choices made about each element affect access and affordability for students from less wealthy families, students of color, and immigrant students? Laws and practices forbidding Black people from getting an education and learning to read were widespread during the era of slavery. Legal segregation prevailed from Emancipation through the Supreme Court’s 1954 Brown v. Board of Education decision and the Civil Rights Act of 1964, which prohibited the most egregious forms of state-sanctioned segregation. Even so, access to higher education has continued to depend in large part on factors marked by racial inequalities. One is access to high-quality and well-funded early, elementary, and secondary education. Another is wealth. Both factors are interrelated, and are related to legacies of segregation in housing and labor markets. While a debt-free higher education program is not a silver bullet, it could open up significant opportunities for less wealthy students, students of color, and immigrant students who would go to college if it were less expensive. Whether a debt-free higher education program actually succeeds in doing so depends on how it is designed. The following table offers a brief equity analysis for each of 10 design elements. 1. Funding (Does the benefit cover costs beyond tuition and fees?) “Last-dollar” guarantees fill the funding gap after students have exhausted federal Pell grant and other grant aid to pay tuition and fees. Last-dollar guarantees don’t cover living expenses beyond tuition and fees. If Pell and other grant aid fully cover a student’s tuition and fees, that student receives no benefit from the program. “First-dollar” guarantees provide the full amount of tuition and fees and still allow students to use Pell and other grant aid to meet the costs of living beyond tuition and fees. First-dollar funding would offer the greatest benefit to students from less wealthy families, who can use Pell and other grant aid to meet other living expenses, like housing, food, child care, transportation, and other necessities. 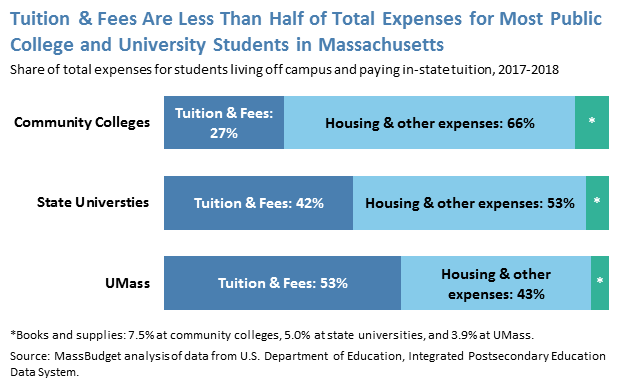 Tuition and fees makes up less than half the total cost of attending public college or university for most Massachusetts undergraduates. 2. Age (Are adult students covered?) Black/African-American, Puerto Rican, Dominican, Colombian, and Cambodian undergraduates are significantly more likely than White students to be 25 and older. And students from less wealthy families may have had a harder time affording college right out of high school. Cutting older students off from higher education when they are adults could further deepen any disadvantage they face relative to their college-educated peers. 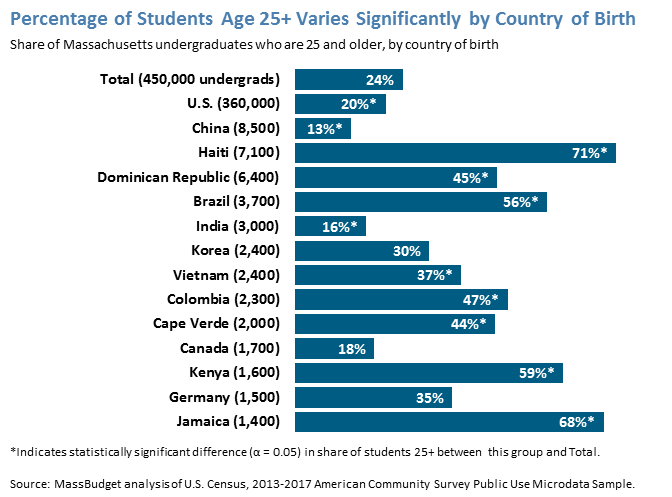 Many of the largest groups of Massachusetts undergraduates born outside the United States—those from Haiti, the Dominican Republic, Brazil, Vietnam, Colombia, Cape Verde, Kenya, and Jamaica—are significantly more likely to be 25 and older than those born here. 3. 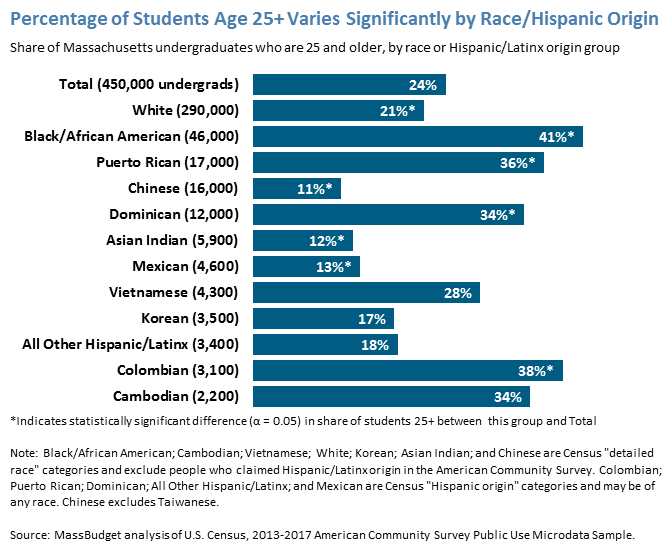 Sector of institution (Public or private) Low-income students, students with disabilities, and Black/African-American and Hispanic/Latinx students in Massachusetts are more likely to attend a public college or university than other students. 4. Level of institution (Two-year or four-year) Because our labor market is set up to reward educational attainment, an associate’s degree leads to fewer career options and lower earnings than a bachelor’s degree. Guaranteeing funding only at community colleges could have the effect of placing students from less wealthy families—who would benefit most from the guarantee—onto separate career tracks from wealthier students. 5. Enrollment intensity (Full-time or part-time) Over one-third of part-time undergraduates in Massachusetts have children at home or work full-time. One in five Massachusetts part-time undergraduates is a working parent. Guaranteeing funding for both full-time and part-time students would make the program more equitable for workers and parents. Part-time undergraduates in Massachusetts are also much more likely to be low-income than full-time undergraduates. 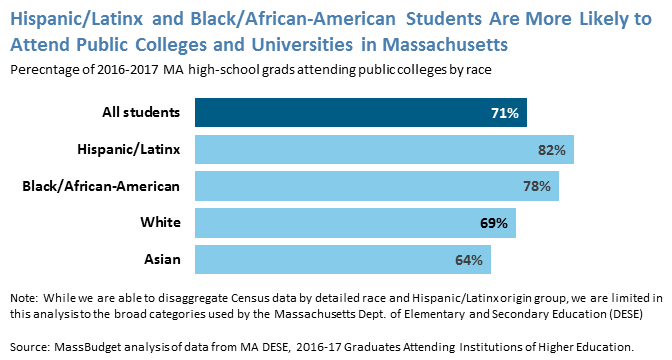 Black/African-American and Hispanic/Latinx undergraduates in Massachusetts are more likely than White undergraduates to attend school part-time. 6. Merit Research has shown that Promise programs with stringent merit requirements can have economically and racially inequitable consequences. State universities and UMass campuses already have merit requirements for admission. Community colleges are open access, meaning they do not have merit requirements for admission. But all institutions require students to maintain “academic standing,” defined as a cumulative 2.0 GPA. 7. Immigration status Students who have been granted deferred action for childhood arrivals (DACA) by the federal government can attend public colleges and universities in Massachusetts for in-state tuition. Undocumented students in Massachusetts must pay out-of-state prices even if they meet all other residency requirements. Neither DACA students nor other undocumented students may apply for federal, state, or institutional grant aid. 8. Income Income caps consider annual income, not accumulated wealth. 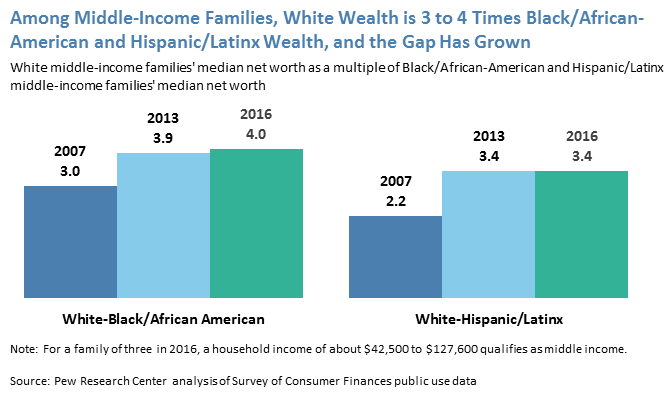 Even among families with similar incomes, the typical Hispanic/Latinx or Black/African-American family has less than one-third the wealth of the typical White family—a gap that has only grown since the Great Recession. So among students made ineligible for a funding guarantee by income caps, White students may be far more likely to access their families’ wealth to pay for college than students of color. 9. Post-graduation residency Some programs have residency requirements, whereby a debt-free grant converts to a loan if a beneficiary leaves the state within a certain number of years after graduating. These could harm graduates who need to move out of state because they or their partners find better jobs than they were able to find in-state, or to take care of a family member who lives out of state. Requiring students before they enter college to make a commitment to living in-state several years later could hamper participation among students with less access to family wealth, because they are likely to be more fearful of having to repay a loan than higher-income and wealthier students. As noted above, these lower-wealth students are far more likely to be students of color. 10. Field of study/credential Guaranteeing funding only for fields of study dictated by labor market demand would require teenagers to be certain about their post-college career paths before they even start college. Students from wealthy families are more likely to be able to pursue a degree in the arts or humanities (which might not be in high demand by industry and thus ineligible for a funding guarantee) because they can take on debt to pay for school and rely in part on their family’s resources afterwards. A student from a less wealthy family, on the other hand, may feel more pressure to avoid debt. If a full-funding guarantee forced them to choose from among only certain disciplines, they would have less freedom of choice than the wealthier student. Again, this constraint would put the greatest pressure on students of color, as their families are likely to be less wealthy than the families of White students. Over the past several years, several cities and states have responded to the college affordability crisis by creating and proposing tuition-free or debt-free higher education programs, known as “Promise” programs.5 The “promise” is the elimination—or at least reduction—of cost barriers for students accepted to college. In reality, Promise programs have been designed with various restrictions on which students and institutions are eligible, what costs are covered, and more. This paper discusses the key design elements of a Promise program, and offers lessons for Massachusetts as it considers a number of proposals to make college tuition-and-fee-free or debt-free. Still, equity in higher education is not simply a question of banning official segregation. Access to higher education opportunities depends, in part, on access to high-quality and well-funded early, elementary, and secondary education. Private early education and care costs more in Massachusetts than in most other states.9 About 20,000 families are on waiting lists for state-subsidized care.10 State funding for early education is down 15 percent (after adjusting for inflation) since the start of this century.11 And because K-12 education funding is so dependent on local property taxes, geographically and racially uneven housing markets — another legacy of historically legal segregation —mean that White students from wealthier school districts are the best prepared for postsecondary education.12 In short, quality education has been made into a privilege for those who can afford it, not a right for all who need it. Access to higher education opportunities also depends on one’s wealth. The best college and university educations go, with few exceptions, to those who can pay the most money. The few exceptions are those schools with multibillion-dollar endowments who can subsidize the attendance of less wealthy students. Funding. Does the program require students to exhaust federal Pell grant and other grant aid before filling the gap; guarantee some minimum funding regardless of whether the student has other grant aid; or guarantee full funding of tuition and fees irrespective of other grant aid? Age. Is the benefit limited to recent high school graduates? Can adult students also participate? Sector of institution. Does the program fund students at private institutions or public only? Level of institution. Does the program fund students at four-year institutions or just two-year? Enrollment intensity. Does the program fund part-time students or full-time only? Merit. Does the program require a minimum high school grade-point average or standardized test score? Immigration status. Does the program cover undocumented students? Income. Does the program cover students of all incomes, or does it cap income eligibility? Post-graduation residency. Does the program require in-state residency after graduation? Field of study/credential. Does the program fund only students in specified degree programs? Does it fund students seeking a non-degree credential like a certificate? Promise programs generally offer one of three types of funding guarantees: first-dollar, middle-dollar, and last-dollar. The most common is a “last-dollar” guarantee. These programs require students to first use federal Pell grant and other grant aid to pay tuition and fees, and then provide the “last dollars” needed to fill the remaining gap. These last-dollar programs don’t cover living expenses beyond tuition and fees, and if Pell and other grant aid fully cover a student’s tuition and fees, that student receives nothing from the Promise program. “First-dollar” guarantees, on the other hand, are not offset by the receipt of other aid. They provide the full amount of tuition and fees and still allow students to use Pell and other grant aid to meet living expenses beyond tuition and fees. Finally, “middle-dollar” programs are similar to last-dollar programs. The difference is middle-dollar programs guarantee some minimal amount of funding to students even if Pell and other grant aid meet all their tuition and fee costs. Students can then use this funding to meet other living expenses. Amid these crises, President Barack Obama’s administration put in place rules to hold for-profit higher education institutions accountable. In 2016, Secretary of Education John King withdrew recognition of the Accrediting Council for Independent Colleges and Schools (ACICS), which was the accrediting body responsible for overseeing Corinthian, ITT, and other for-profits. President Donald Trump’s Secretary of Education Betsy DeVos has sought to undo the Obama-era regulations, and she has restored accrediting authority to ACICS.23 A Promise program that offers free public undergraduate education to adult students could constrain for-profits’ growth among this age group at a time when the federal government is no longer holding this troubled industry accountable. To the extent that Massachusetts has an interest in combining guaranteed funding for students with the ability to ensure academic quality and other standards at the schools those students attend, it would be hard-pressed to do so under the status quo. Most Promise programs limit the benefit to students at community colleges, though more recently created or proposed programs cover four-year schools, as well.31 Whether or not to cover students at four-year schools is an important equity question. Because our labor market is set up to reward educational attainment, an associate’s degree leads to fewer career options and lower earnings than a bachelor’s degree. A Promise program that guarantees funding only at community colleges could have the effect of placing lower-income students—who would benefit most from the guarantee—onto separate career tracks from higher-income students. Limiting the funding guarantee only to students at two-year schools may also lead to “undermatching.” Undermatching happens when students who may qualify for—and can afford—more selective four-year institutions choose a less expensive option based mainly on cost. So restricting the benefit to less expensive two-year institutions could lead to adverse post-graduation consequences not readily apparent at the moment someone is deciding where to apply to college based primarily on cost. In Massachusetts, researchers Sarah Cohodes and Joshua Goodman found that the Adams Scholarship — a waiver of public college and university tuition (but not fees, which make up a much larger share of mandatory costs) — found that such undermatching might occur among some students when four-year public universities are made more affordable. High-achieving students from middle-income school districts were found to have chosen four-year public Massachusetts universities that measured lower on “a combination of graduation rates, academic skill of the student body, and instructional expenditures” than more selective four-year institutions for which they were academically qualified.32 The effect wasn’t limited to enrollment: these students also graduated at lower rates than if they had enrolled at the more selective options. An important caveat in applying the lessons from the Cohodes-Goodman study to proposed Promise programs is that the Adams Scholarship is a relatively small tuition-only waiver, amounting to about eight to 16 percent of combined tuition and fees in the 2018-2019 academic year.34 Fully subsidizing tuition and fees could lead to increases in both overall enrollment among students from low-income districts and undermatching among high-achieving students from middle-income school districts. Cohodes and Goodman found no “crowding-out” effect among students from high-income districts (that is, these students didn’t forgo more selective options to take public university slots away from other students), but it is possible that such an effect could emerge under the much higher benefit provided under the debt-free proposal, compared with the Adams Scholarship’s relatively small tuition-only waiver. Among students from middle-income districts, however, their study does raise at least the possibility of a crowding-out effect. Namely, students who might be qualified to enroll at a more selective college could choose to enroll at a state university. Because there are limited slots at these state universities, such a choice could have the effect of displacing a student for whom state universities are the only viable postsecondary option. The effect of increasing enrollment among lower-income students is notable, and brings up questions of equity when considering whether to cover students at four-year institutions. The potential for undermatching and crowding out among middle-income students points to the need to match investments in access and affordability with investments in quality, in order to make public colleges and universities a top choice for all students. As noted above, per-student funding of public higher education fell 32 percent from Fiscal Year (FY) 2001 to FY 2018. Part-time undergraduates in Massachusetts are also much more likely to be low-income than full-time undergraduates. More than half come from families with annual incomes of $50,000 or less, and a quarter come from families with incomes over $100,000. By contrast, almost half of full-time undergraduates comes from families with incomes over $100,000. 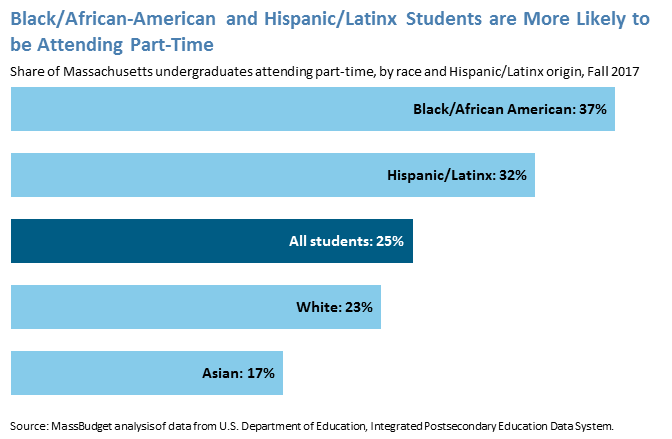 Among Black/African-American and Hispanic/Latinx undergraduates in Massachusetts, larger percentages attend school part-time than among all Massachusetts undergraduates. State universities and UMass campuses already have merit requirements for admission, and they could maintain these under the Massachusetts debt-free higher education proposal. Community colleges are open access, meaning they do not have merit requirement for admission. But all institutions require students to maintain “academic standing,” defined as a cumulative 2.0 GPA. The Massachusetts debt-free proposal does not seek to change that standard. There are an estimated 11,000 undocumented immigrants in Massachusetts between the ages of 13 and 17. Among the state’s undocumented immigrants 25 and older, 57,000 have a high school diploma, some college, or an associate’s degree.38 Undocumented immigrants are not eligible for federal aid. While students who have been granted deferred action for childhood arrivals (DACA) by the federal government can attend public colleges and universities in Massachusetts for in-state tuition, undocumented students in Massachusetts must pay out-of-state prices even if they meet all other residency requirements. (Currently 18 states allow undocumented students to pay in-state tuition.39) Neither DACA students nor undocumented students may apply for federal, state, or institutional grant aid. Bills to allow all undocumented immigrants who have attended three years of high school in Massachusetts to pay in-state tuition, and to qualify for state and institutional aid, have been filed in several consecutive legislative sessions, including the current one. In 2016, the typical middle-income White family had a net worth 3.4 times the typical middle-income Hispanic/Latinx family, and four times the typical middle-income Black/African-American family. These gaps have grown larger since the Great Recession.40 So among students made ineligible for a funding guarantee by income caps, White students will still be far more likely to access their families’ wealth to pay for college than students of color. Second, a simple income cap doesn’t account for family size, or whether the student is from a higher- or lower-cost region of Massachusetts. Finally, imposing an income cap would likely have the effect of creating an expectation that our public higher education system is primarily for students from families with fewer resources. Eschewing income caps would instead guarantee a debt-free college education to everyone who is admitted. Students from families with fewer resources would still be eligible for other forms of need-based aid. It may seem reasonable at first to expect students to remain in Massachusetts after their college education, when that education has been fully funded by the state. New York State’s Excelsior program, for example, requires students to stay in the state for the same number of years after graduation as the length of the award. For example, if a student receives the Excelsior scholarship for four years and lives in New York State for three years after graduation, one-quarter of the grant would convert to a loan. A potential problem with this residency requirement is that it would harm any graduates who needs to move out of Massachusetts because of a job opportunity or to take care of a family member who lives out-of-state. Requiring students, before they enter college, to make a commitment to living in-state several years later could hamper participation among students with lower-incomes and students with less access to family wealth, because they are likely to be more fearful of having to repay loans than higher-income and wealthier students. And, as noted earlier, these lower-wealth students are far more likely to be students of color. Some Promise programs require students to enroll in “high-demand” fields: majors that match the labor needs of the private sector. Such an imposition would require teenagers to be certain about their post-college career paths before they even start college. What if a student in a qualifying major decides midway that they would be happier switching to a non-qualifying major? Equity issues arise here, as well. A student from a wealthy family is more likely to be able to pursue a degree in the arts or humanities (which might not be in high demand by industry and thus not eligible for a funding guarantee) because, thanks to their family’s resources, they can take on debt to pay for school and may not be totally dependent on their own earnings afterwards. A student from a less wealthy family, on the other hand, may feel more pressure to avoid debt. If a full-funding guarantee forced them to choose only certain disciplines, they would have less freedom of choice than the wealthier student. 5 Mark Huelsman, Demos, September 26, 2018, “A Blueprint for College Debt” [https://www.demos.org/sites/default/files/publications/A%20Blue%20Print%20for%20College%20Without%20Debt_0.pdf]; Tiffany Jones and Katie Berger, The Education Trust, 2018, “A Promise Fulfilled: A Framework for Equitable Free College Programs” (esp. the table on pp. 5-6) [https://edtrust.org/resource/a-promise-fulfilled/]; Jen Mishory, The Century Foundation, March 5, 2018, “The Future of Statewide College Promise Programs” [https://tcf.org/content/report/future-statewide-college-promise-programs/]. These three reports form the basis for most of this paper’s general characterizations of Promise programs. “Tuition-free” programs are designed to ensure that beneficiaries can attend college without paying tuition (and fees), but leave students responsible for covering living expenses. “Debt-free” programs are designed to cover all expenses, many of which students now meet by borrowing. 17 Jones and Berger, pp. 5-6. Of the 15 active programs listed, three allow adults and returning students to participate. Of the 16 more recent proposals listed, nine do so. 28 Laura Krantz, Boston Globe, March 6, 2019, “Baker wants increased state oversight of private colleges” [https://www.bostonglobe.com/metro/2019/03/06/baker-wants-increased-state-oversight-private-colleges/uzWS5w1YtlXLrYIXLcGEMM/story.html]. For specific bills filed in the 191st Massachusetts legislature, see Senate Bill 761, “An Act relative to transparency in higher education” [ https://malegislature.gov/Bills/191/S761]; House Bill 1217, “An Act relative to higher education transparency” [https://malegislature.gov/Bills/191/H1217]; and Senate Bill 2183, “An Act to support improved financial stability in higher education” [https://malegislature.gov/Bills/191/S2183]. 29 MassBudget analysis of data from Massachusetts Department of Elementary and Secondary Education, 2016-17 Graduates Attending Institutions of Higher Education [http://profiles.doe.mass.edu/statereport/gradsattendingcollege.aspx]. “Low-income” is used here instead of the Massachusetts Department of Elementary and Secondary Education’s (DESE) technical but less widely familiar term “economically disadvantaged.” DESE used to define students as “low-income” based on participation in the free or reduced-price lunch program. Now DESE defines students as “economically disadvantaged” if, according to DESE data, they participate in any of the following programs: Supplemental Nutrition Assistance Program (“food stamps”); Transitional Assistance for Families with Dependent Children (TAFDC); the Department of Children and Families' (DCF) foster care program; and MassHealth (Medicaid). 31 Jones and Berger, pp. 5-6. Of the 15 active programs listed, 6 cover four-year institutions. Of the 16 more recent proposals listed, 8 do so. 36 MassBudget analysis of data from Sarah Flood, Miriam King, Renae Rodgers, Steven Ruggles, and J. Robert Warren. Integrated Public Use Microdata Series, Current Population Survey: Version 6.0 [dataset]. Minneapolis, MN: IPUMS, 2018. “Full-time” is 35 hours or more per week. This research was funded in part by the Annie E. Casey Foundation. We thank them for their support but acknowledge that the findings and conclusions presented in this report are those of MassBudget alone, and do not necessarily reflect the opinions of the Foundation.